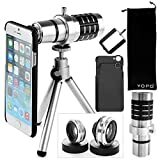 4 in 1 lens kit: Telephoto lens, fish-eye lens, macro and wide angle lenses all in this kit, turn your iPhone 6s/ 6s Plus / 6 plus / 6 into DSLR Camera easily. 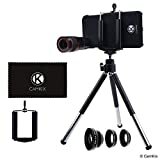 Multiple uses: High resolution, the 12x telephoto lens helps you take long distance pictures clearly. Like bird watching, wildlife watching or other scenery, sports games as football and basketball and so on. Fisheye lens helps creating interesting tubby images; macro lens can be used to take small objects, and the wide angle lens for large ranges objects. High quality: The four lenses are made of good coated optical lens and high-quality aluminum alloy, to help you experience high quality iPhone photography. Portable and detachable: Lightweight and easy to take around. Note: Macro lens and wide angle lens are screwed together upon arrival. When you use macro lens, unscrew the lens; when you use wide angle lens, screw together. 1.Where is the macro lens? 2. 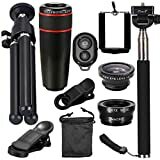 Will my iPhone pixel be changed by using this lens kit? No, the iPhone lens kit is used for taking more interesting images only, but cannot change the original image pixel. 3, Will this work on iPhone 7 plus? No, this color option “Silver” on product detail page contains 2 cases, which can work on iPhone 6, iPhone 6s, iPhone 6 plus, iPhone 6s plus. The other color option “iPhone 7” contains only 1 case, which works for iPhone 7.